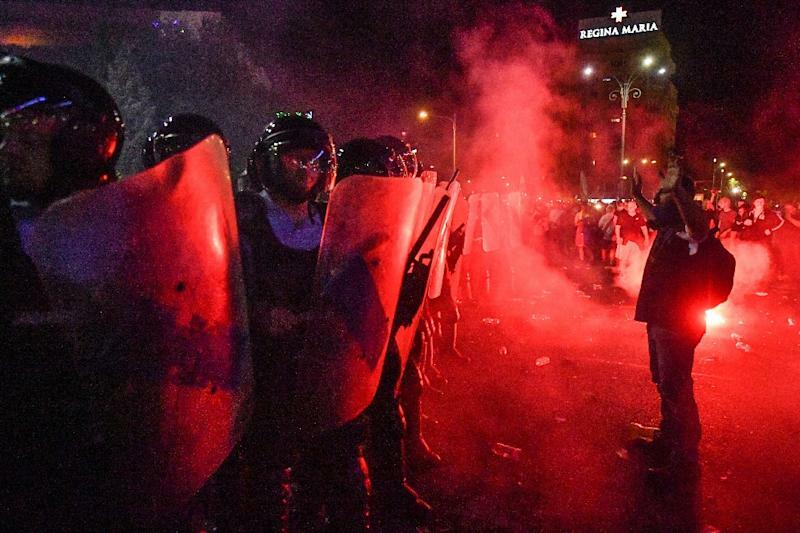 Bucharest (AFP) - More than 450 people were hurt and around 30 arrested during a huge anti-corruption protest in Bucharest, Romanian police said on Saturday, a day after the rally. Police had used water cannons and tear gas to disperse the protesters as tens of thousands rallied to call on the leftwing government to resign. Many demonstrators needed treatment after inhaling pepper spray and tear gas, while others suffered blows, hospital sources said. Around 30 police were also injured, 11 of whom were taken to hospital. Police rejected criticism from the centre-right opposition that its officers had used excessive force, saying its response to violence by dozens of protesters had been "gradual and proportionate". Austrian Chancellor Sebastian Kurz, whose country currently holds the EU rotating presidency, criticised the clashes, which also saw a cameraman for Austria's public broadcaster injured. "We strongly condemn the violent clashes in Bucharest where numerous demonstrators and journalists were injured. We expect full explanations," he said on Twitter. "Freedom of expression and, related to that, freedom of the press are basic freedoms of the EU, which we clearly recognise and which must be unconditionally protected." Local media said up to 80,000 people had taken to the streets, among them many Romanian expatriates who returned home to show their anger at the graft in one of the EU's most corruption-plagued member states. Prime Minister Viorica Dancila, in turn, accused Iohannis of "inciting the population against the authorities" and "using the dramatic effects of the events". Another demonstration is planned for later Saturday in Bucharest. In a controversial move last month, Romania sacked top anti-graft prosecutor Laura Codruta Kovesi -- considered a symbol of the country's fight against corruption. With Kovesi at the helm, the Anti-Corruption Prosecutor's Office (DNA) had led a crackdown on corruption among local and national elected officials, earning the enmity of many in Romania's political class and prompting critics to accuse it of abuse of power.